AFP-RI is governed by a volunteer board of directors. The AFP-RI Board of Directors oversees a range of planning committees that carry out the important work of our Chapter. To learn more about any committee or to get involved, please contact the committee chair directly. The Awards and Scholarships Committee reviews applications for AFP-RI’s professional development and conference scholarships, as well as nominations for our Chapter’s National Philanthropy Day Awards. This committee also solicits scholarship applications from Rhode Island high school students and selects one recipient annually to receive the Herbert E. Kaplan Youth in Philanthropy Scholarship. The Chapter Inclusion, Diversity, Equity and Access (IDEA) Committee creates, implements and monitors the chapter's diversity and inclusion goals and objectives, and ensures that diversity and inclusion is incorporated into all aspects of the chapter's operations. The Governance Committee identifies potential qualified professionals to join the board as well as committee volunteers. The committee also evaluates any changes to bylaws or policies of our Chapter. The Government Relations Committee has a primary role to educate members regarding public policy issues which impact nonprofits. The committee will lead engagement with government officials, especially those holding elected office in Rhode Island to support ethical fundraising and donors’ rights. 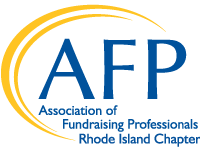 The Marketing Committee works to promote awareness of AFP-RI, National Philanthropy Day, AFP-RI educational programs and networking events, and the accomplishments of our members within the Rhode Island and southeastern Massachusetts communities through digital marketing and social media. The Membership Committee develops and implements strategies to identify and recruit new members and retain existing ones. The Membership Committee conducts outreach to prospective members by mail, e-mail, phone, and in person. Together with the Professional Development Committee, we meet throughout the year to plan programs that will benefit Chapter members including networking breakfasts, a holiday gathering and an annual meeting. This committee plans and executes the state’s premier event celebrating philanthropy, with nearly 500 attendees. The National Philanthropy Day committee secures corporate sponsorships, coordinates marketing and outreach efforts, produces event collateral including a program book, and manages all event logistics.